Pádraig Óg Ó Ruairc on the debate on a controversial killing on the last day of the Irish War of Independence. On the night of the 10 July 1921, the eve of the Truce that ended the War of Independence, four British soldiers; Corporal Harold Daker, Private Henry Morris, Private Alfred Camm and Private Albert Powell were abducted by an IRA unit in Cork. On the eve of the truce, four off-duty British soldiers were abducted and shot dead in Cork city. The following morning, just two hours before the ceasefire began, the bodies of four soldiers were found in Ellis’ Quarry on the outskirts of Cork. Each soldier had been blindfolded and shot through the head. 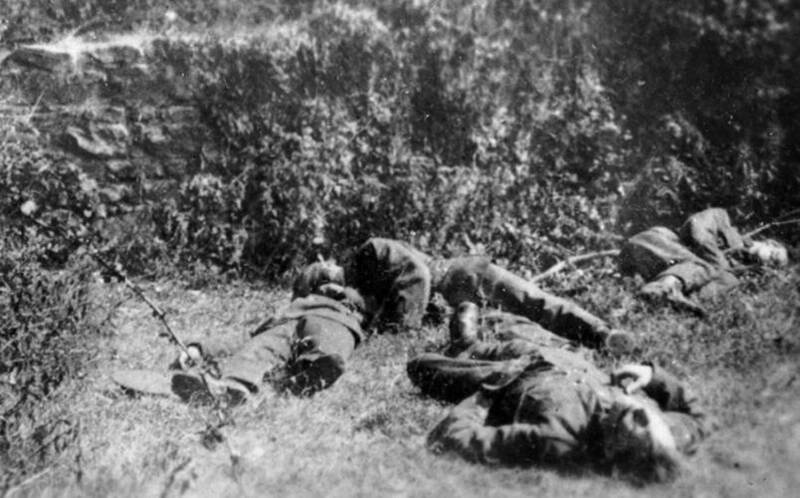 A British soldier photographed the bodies in situ (see photo) and the killings soon featured in anti-Republican propaganda produced by the British military and the Free State. A century later this incident remains one of the most controversial events of the War of Independence. It has repeatedly been presented in academic work, popular histories, newspaper columns and on television as pointless unprovoked murder committed by republicans whose sole motivation was a belief that the impending ceasefire meant they could never be brought to account. In The IRA and Its Enemies Peter Hart used this incident as an example of the IRA’s ‘dirty war’ and he later suggested that republicans ‘made a point of killing as many enemies as possible up until the last minute [before the Truce]’. Writing in the Irish Times Kevin Myers cited the killing as an example of how the IRA exploited the announcement of the Truce as ‘a once-in-a-lifetime Summer Sale of murder, guaranteed without legal consequence’. Eoghan Harris suggested in the Sunday Independent that the shootings were the direct result of IRA ‘blood lust’. The killings also featured in Eunan O’Halpin’s TV3 documentary In The Name of the Republic. The killings have been cited as examples of ‘IRA blood lust’. These killings became part of the urban folklore of Cork and stories about the event were embellished to emphasise that these British soldiers were mere boys who left their barracks to go sweet shopping. 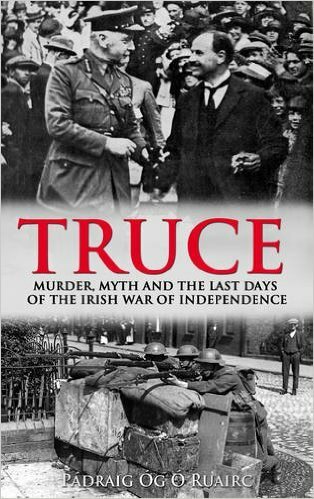 Cork author Gerard Murphy cited the killings in his book The Year of Disappearances as an indicator of the ‘degradation’ the IRA had sunk to by 1921 and stated the four were ‘teenage soldiers who had gone out to buy sweets in view of the impending Truce’. Despite the significant attention that has been paid to these killings none of those who wrote them questioned the assumption that the killings were sparked by the advent of the Truce. Furthermore, none of these authors researched the context of the killings in enough depth to establish that there were direct links between the Ellis Quarry killings and the killing of an IRA Volunteer by the British forces the previous night. Now, recently released material from the Military Archives not only exonerates Connie Neenan – it also identifys those responsible. There is no evidence to support the claim that the soldiers left their barracks specifically to go sweet shopping when they were killed. Although one of the soldiers may have had a bag of sweets when captured, the earliest account of the shootings from Walter Phillip’s The Revolution in Ireland (1923) states the four soldiers ‘were being “treated” by a friendly publican in celebration of the Truce’. The probability that the soldiers had been drinking when captured has been erased from the most recent highly emotive accounts of the incident which seek to emphasise the supposed innocence and childlike demeanour of the soldiers. Claims that the soldiers were mere ‘teenagers’ are false – all four soldiers were aged in their twenties. Claims that the soldiers were mere ‘teenagers’ are false – all four soldiers were aged in their twenties. Nor were the soldiers particularly naive or inexperienced ‘raw recruits’. 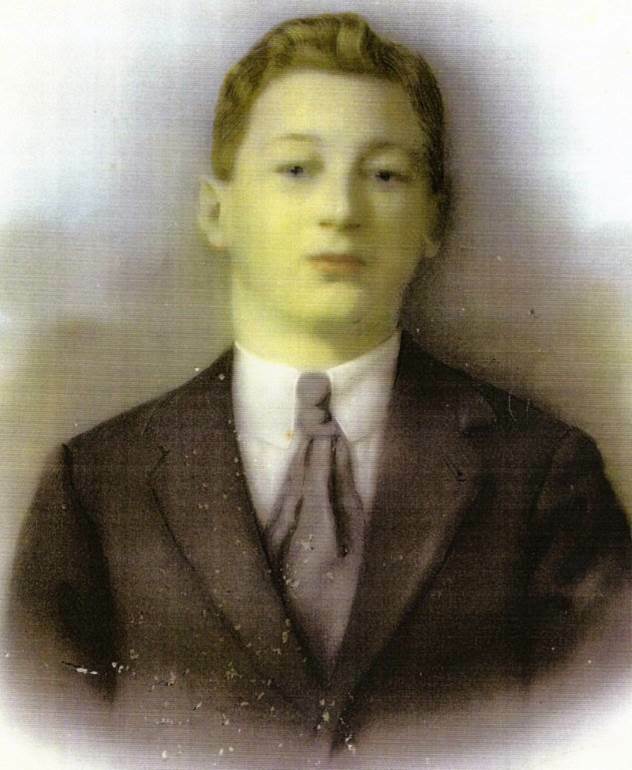 One of the four Henry Morris, was a labourer before joining the British Army in 1914. He was a veteran of the First World War and had served on the Western Front, where he was wounded twice and survived a gas attack. The author of this report, the Captain of H Company, 1st Battalion, Cork City Brigade, had led the operation and ordered the executions. However, like most contemporary IRA reports, it was signed with his rank, not his name which made it practically impossible to identify him. The recent release of the IRA Organisation and Membership Files by the Military Archives enables us for the first time to identify those who held rank in IRA at the time of the Truce. The Captain of H Company who wrote this report and ordered the executions was Dan Hallinan a 36 year old, plasterer from Bishopstown, Cork. Not only does the identification of Hallinan exonerate Neenan, it also suggests a definite motive for the Ellis Quarry killings. 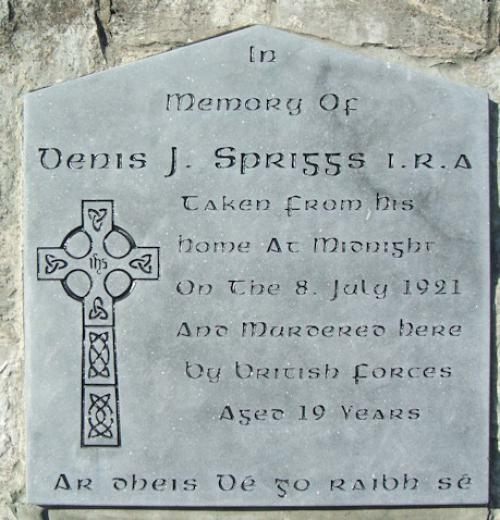 The killings seem to have been a reprisal for the killing of IRA Volunteer Denis Spriggs the night before. The night before the Ellis Quarry killings, British soldiers captured IRA Volunteer Denis Spriggs at his family home in Strawberry Hill, Cork. Spriggs, a 20 year old plasterer, was asleep in bed when the raiders struck at midnight. He was unarmed and on being confronted by the British soldiers he immediately surrendered without offering resistance. Spriggs was placed on a lorry with an armed guard and was driven a short distance to Blarney Street where he was shot dead. The official British military version of events is that Spriggs had been shot dead ‘while attempting to escape’. However the officer who led the raid, Lieutenant d’Ydewalle, had a history of involvement in the killings of unarmed prisoners and the likelihood is that Spriggs’ killing was a premeditated and deliberate act. The British soldiers who had killed Spriggs were members of the South Staffordshire Regiment. Two of the British soldiers killed at Ellis quarry the following night, Daker and Morris were also South Staffordshires. Hallinan who ordered their execution appears to have known Denis Spriggs personally. As well as being members of the same IRA Battalion, both Hallinan and Spriggs worked as plasterers and were involved in the Cork Plasterers’ Union. All of the previous multiple shootings of off-duty British soldiers in Cork had been reprisals to avenge local IRA Volunteers killed while prisoners in British custody. These facts suggest that, far from being a pointless and unprovoked mass murder, the Ellis Quarry killings were a reprisal for the killing of Spriggs. 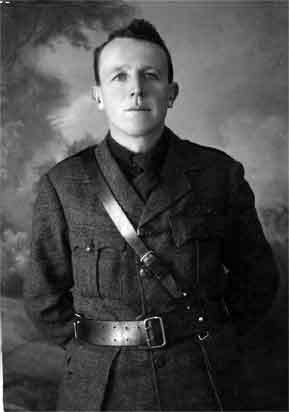 Daniel Hallinan was expelled from the IRA during the Truce period, he was exiled from Cork and went to Dublin to enlist in the Civic Guard Ireland’s new pro-Treaty police force. Hallinan was quickly promoted to the rank of Superintendent but his career as a police officer was short-lived. He was expelled from the force in January 1925 for indiscipline. Hallinan returned to Cork and resumed his previous trade as a plasterer. Hallinan was brought to court in 1932 charged with the theft of funds belonging to the Operative Plasters and Tilers Society. He was declared bankrupt shortly afterwards and served a term of imprisonment in Cork Jail. Plaque marking spot where Spriggs was killed. Although it was widely known that those responsible for the Ellis Quarry killings had taken a pro-Treaty stance during the Civil War the incident was continually exploited by prominent Free State supporters in Cork who sought to blame Connie Neenan and his anti-Treaty IRA comrades. Whilst Hallinan’s role as the orchestrator of the Ellis Quarry killings has only just come to light – the information about the involvement of the South Staffordshire regiment in both that incident and the killing of Denis Spriggs has been available for decades. Those keen to re-tell the tale of the Ellis Quarry killings as an unprovoked and cynical exploitation of the announcement of the Truce have consistently failed to put the incident in its historical context or explore whether the IRA had any other possible motives. The simplistic way the Ellis Quarry Killings has been portrayed and its exploitation as anti-Republican propaganda is typical of similar stories about pre-Truce killings which have also become highly mythologised. By focusing inordinately on IRA killings in the pre-Truce period, generations of historians and writers have produced a biased history of the last days of the War of Independence and created a hierarchy of victimhood lamenting the deaths of those killed in eleventh-hour IRA attacks while consistently ignoring equally contentious killings committed by the British forces in the same period. Connie Neenan Memoir, Cork City and County Archives pps 70a -71. Uniseann McEoin, Survivors, Dublin (1980), p. 241. Eoghan Harris, Sunday Independent, 31st March 2013. Eunan O’Halpin, In the Name of the Republic, TV3, March 2013. 14 Responses to "The Ellis Quarry Killings"
Hello Daniel – its not 100% certain why. It’s tempting to say that he was drummed out of the Cork in relation to the Ellis Quarry Killings but given his subsequent dismissal from the Civic Guard and the Cork Plasterer’s Union I think it is more likely that it had something to do with his behavior or personality, maybe he was regarded as a “loose cannon”. But without more information all this is just conjecture. The short answer is we don’t know why but hopefully I’ll find more data to explain it on some future trip to the archives. Indeed, the term that sprang to mind while reading that bit in your article was ‘incorrigible’. A very good article, IMO – definitely shows how the sources that are only just coming to light (the BMH Statements are another such case) can help us dig, or at least try to dig, beneath the surface of events from that time (the RIC reports remain an elusive source as they’re based in the UK Archives, at least as I understand it, and have yet to be put online unlike the BMH). Hello Daniel – there are copies of the RIC monthly inspectors reports available on Microfilm in the National Library of Ireland in Dublin – Colonial Office Papers 904.They make very interesting reading. Ah, great, cheers! Would they cover the War of Independence period? I guess it’s true what they say about learning something new every day. Padraig, v interesting research – lived for years at top of Blarney street and we were very aware of the Spriggs memorial as we grew up. I have scanned the 25 inch OS map trying to id Ellis’ Quarry and can see two contenders near the Lough. Do you know where the quarry is located? Denis Spriggs was my grandafther’s brother. I grew up in California but I knew the story well about how Denis was taken from his home near midnight driven a little down the road and executed against a wall, where the plaque has been since those times. That is not the original wall plaque though, This is sad reading but also very interesting local Cork history. Thank you Padraig Og O Ruairc for your thoroughly earned Ph.D.
Today I think the location would be approximately where Ashwood Estate and Hillside Grove meet. I’ve been told by local historian Barry Keane that the wall seen in the background of the photo of the soldiers bodies still exists – but I don’t know the area well enough to comment further. I also met Connie Neenan in 61 or 62 when he visited my grandfather at 16 Evergreen Street. My mother and Iwere ushered out of the house. When Connie Neenan emerged he gave me a ten Bob note much to the delight of my mother! I got sixpence, a tanner! Denis Spriggs was my uncle (mothers brother). Found your story very informative. Knew most of the history from my mother. Lived at 6 St. Dominic’s Terrace until I left for the USA. Would like any info on Denis Spriggs commemoration planned for this year.